It’s hard not to love Nicolas. Not only is he a talented calligrapher, but his warmth, generosity, and sunny personality just make people want to be around him. That’s one of the things that struck me the most — his ability to meet people and let himself be guided and inspired by those encounters. That’s kind of the story of my own life, as well — after spending a year studying literature in college, I realized all my friends were artists, and that helped me understand who I was and to make the right choices. I’m also really touched by his passion for an art that’s been somewhat overlooked, kind of like illustration, which used to be all over magazines in the past, and is so rare today. Plus, we both come from similar backgrounds, and if there’s one thing that means a lot to me, it’s being able to say that no matter where you come from, or where you started, there are no limits when you follow your passions. Now I’ll let you read the interview with Nicolas! When I was a child, I wanted to be a butcher. I don’t know why exactly. Where does your family come from? Where did you grow up? I was born into a middle class family. My father is from Algeria, he was born in the mountains. My mother comes from the South of France, in the Pyrenees. They are both mountain people and they left their families at a very young age to settle in Paris, which was really hard at the time. So I was born into a little family in Oberkampf. Now, it’s a super trendy neighborhood in Paris, but before it was not like that at all. I went to a private school, but I started doing graffiti and things like that around that time. My mother works in administration and my father is a locksmith. But I always had an artistic upbringing because my parents love cinema and theater. They learned everything completely on their own. They were never part of the intellectual crowd–they just read all the time. We always visited galleries and museums together. I was a good student at school because I didn’t play with the others kids that much. I was kind of lonely. I went to religious private schools. My parents would let me do anything as long as I had good grades. I graduated from high school, then went to business school because I didn’t know what else to do. I did an internship at a bank, but finance didn’t suit me. That’s why I decided to start working at a gallery–because it had always intrigued me. So that’s what I did. I met César Pape, a big collector with a lot of money. We opened our own gallery right behind the Académie Francaise, and that’s how I started to meet people, like Pierre Bergé, for instance. I was in my twenties at the time. Before that, I didn’t know anyone in the art world. What did your parents think about that change? My parents trust me completely. For them, if you start something on your own, if it’s your choice, then you should make it work. And if you’re not happy, it’s your fault because it was your choice in the first place. What exactly did you do at the gallery? At the César Pape gallery, I managed all of the financial aspects of the gallery; I was the businessman. I made lists of all the collectors I was meeting; I created a system for managing the stock. All of the art we displayed was by artists who were already dead, and we had some real estate property as well. So, were you always interested in art? How did you learn about art and art history? I knew the sculptures at the Louvre, the Musée d’Orsay, and was familiar with New Realism and the major schools of art because I used to go there often with my parents and that’s what interested me. I got that culture from my parents. After that, I developed my own culture by meeting people at the gallery. It clicked when I went to an Andy Warhol show, one of the first ones organized in Paris. There were a lot of drawings of shoes. I was waiting for a meeting and I started copying everything I saw in the prints and labels in front of me. Why didn’t you stay at the gallery? The problem is that big collectors have a hard time separating themselves from their things, so I started to realize that I was working in a museum rather than a gallery. Since I was the one who had organized everything from the start, I decided to leave and do something else. That’s when I met Jean-Gabriel Mitterand, the owner of JGM Gallery. There, all of the artists were still alive and I was able to meet all of them. I could see how they progressed in their studios; I was able to organize exhibitions internationally. With all of these exhibitions, the gallery started to gain recognition, and we were able to move into a hôtel particulier. I met aristocrats, politicians, usually at private dinners. It was important to me to find collectors with totally different backgrounds and experiences. And I always felt like we were bad at welcoming them. That’s how it all started. The next day, we sent all the invitations and 98% of the guests showed up to the opening. Within an hour, everything was sold..
A week later, we organized a dinner to thank everyone for coming and I did the same thing. I had never received illustrations done by a calligrapher before, but Jean-Gabriel had. I had never even thought about doing it before. It was mostly word-of-mouth. People were asking Jean-Gabriel who was writing his envelopes. I started to make seating cards for dinners with different lettering for each guest. I realized that everyone was taking the cards with them when they left. It was awesome. I thought that it was something special. After that, we noticed that people were coming to openings with their invitations. Usually you don’t bring it with you, it’s just there to give you the information you need. At the gallery, I met the artist Nikki de Saint Phalle. We became really close friends because I went to visit her in her studio in Guadalajara quite a few times. I was so impressed by her handcrafted work. I decided to go to Brazil and left the gallery. I didn’t know what to do with my life anymore. I was fine, but I was working way too much. I was making a good living, things were going really well…it was like a teenage crisis, I guess. I met a lot of people there, but I spent all my money in 2 weeks–shopping, partying, taking samba classes… I was totally broke, so I called my parents and asked them to buy me a plane ticket back, but they told me to figure it out on my own. So I stayed and became a French teacher at the Alliance Française to pay for my room. In Brazil, I met the director of Les Enfants du Coeur, a children’s foundation. She invited me to dinner at her house, and that’s where I met Patricia Carta, the editor-in-chief of Vogue Brazil at the time. I worked as her production assistant, then in PR, because I was trying to work on projects on the side to see if there were any opportunities with big brands. Then I met Dominique Borromei, an incredible painter. She was totally insane and fascinating. We shared an apartment in Rio and she taught me how to draw, with her craziness and alcoholism, and how to use a paintbrush, She taught me how to express everything I had inside of me. I was really sad, but I couldn’t express my emotions and feelings because I was too shy. When she died of cancer, it was heartbreaking. On her deathbed, she made me promise to keep making lines and rhythms; she told me that that was my work. So I had to keep my promise. How did you end up back in Paris? I went back to Brazil, and started working again, but Pia de Brantes (a friend of mine who was involved with the JGM Gallery) and Jean-Gabriel asked me to come back to Paris because they needed an in-house calligrapher and couldn’t find anyone who wanted to do the job in Paris. What really excited me was finding a specific lettering for a specific person, and to look at what the person loved. I liked trying to create lines that corresponded to a person, a personality, that’s what I found exciting about the art of writing. So I went back to Paris after spending more than a year in Brazil. I met up with Pia, and we started working together the very next day. She was very reassuring and told me that we would take our time, because I didn’t know anything about calligraphy. Zero. I didn’t know anything about it, but I had always been interested in typography. That always interests me whenever I travel. And I write constantly. Soon after, Pia put me in charge of writing out 250 invitations for a wedding she was organizing at the Chateau de Versailles. Who else was doing calligraphy in Paris at the time? At the time there was only one woman doing calligraphy, and she only did three types of writing: English, gothic, and manuscript. Very simple. There was also another company who made invitations, as well. But that was it. So the trend of sending calligraphy invitations started with you? Yes, the trend started 7 or 8 years ago. Before then, it was all printed or on labels. I first remember you from the Rick Owens show…how did you get involved with fashion brands? After doing the Rick Owens logos, I started building my business one step at a time; it came naturally. I started with Prada. Madame Prada and I decided to create handwriting for Prada–a sort of college, British boarding school type of writing–very simple, very clear. I loved the idea of creating our own world with brands and people. That’s how it happened. What is involved in your work, exactly? I do everything that has to do with calligraphy. I can do embroidery or engravings on precious stones with an architect, with lots of sentences. I also work with the State a lot because they have institutions that need inscriptions like “No Smoking”. I work a lot with the Rijksmuseum in Amsterdam, and with jewelers doing calligraphy on the inside of the actual diamonds. I also enjoy working with designers in the new digital world. I love that they ask me to work with them even though I am a calligrapher—it’s pretty incredible. People working with digital really want to move toward something timeless and to be able to give people something they will always need. What do you work on the most? Invitations, fashion weeks? I only do invitations for fashion shows during Fashion Week. It’s a big season, very intense, very commercial. But the majority of my work is very diverse. I conceptualize logos, I recreate logos to make them more modern, I do tattoos, rebranding for companies, museums. All of this is based on calligraphy. And what does your work as a brand ambassador for Louis Vuitton or Mont Blanc entail? I am a consultant, so every time they want to launch a product, they ask for my opinion. For example, right now they are releasing the “calligraphy trunk” and I’ll be there to provide support when dealing with the press. I like the idea of bringing heritage back to life, and making it more modern, understandable today. As a calligrapher, it’s hard to have credibility. I’m an ambassador but I don’t belong to one brand. I like to work with everyone because calligraphy is an art with endless possibilities. Everyone can inspire me and give me ideas. I’m very disappointed by the idea that people have of calligraphy, which is very negative. They see it as something dusty, antique. It’s hard to change people’s minds, so I decide to show them instead of trying to convince them. I take photos of everything. I have a really good memory, even when it comes to things that you don’t want to remember. I love reading–I have huge libraries of books. I do a lot of research. One day I gave this lecture at a graphic design school and I told the students that for me, calligraphy is a way of life more than a thing to do. Like a ballet dancer, over time, you get better. You have to practice, 8 hours a day, even. It’s not like riding a bicycle; it doesn’t come back just like that. What I really like is interacting with people. I love when I can learn from someone else, but especially if it goes both ways. If I’m in dialogue with someone, I will obviously give a lot in return. I’m very disappointed by the idea that people have of calligraphy, which is very negative. They see it as something dusty, antique. It’s hard to change people’s minds, so I decide to show them instead of trying to convince them. I was an Arts teacher every Wednesday for children in 1st grade. Children are a big part of my inspiration. They have this sweet craziness; they have no control over what they do. When a child takes a pen, when he looks with his big eyes, he creates things he doesn’t necessarily understand, with no preconceived ideas. I really like that. So I include children in my work very often. I also work with people with physical handicaps, people with Autism, and people with Down’s Syndrome. We work on the specific emotions that create particular lines. It’s really motivating and emotional because they never thought they could do it. They also don’t have any limits, and that creates a really strong connection. No, not really, other than 7 years ago when the owner of the pen company Bic asked me to do a collaborate with a Chinese calligrapher who was 102 years old and create a sort of happening together. I went to China to meet this incredible man, and I was super impressed. I watched him work, his posture, his breathing, everything was fascinating. I taught him how to use my instruments, my pens. We exchanged brushes and now I bring the one he gave me everywhere I go. When I used his brush for the first time, I immediately knew how to use it by instinct. Instead of staying 3 days, I stayed for 3 weeks, I lived with him and we exchanged without talking. The only form of communication we had was through calligraphy. That’s the only intense training I had. I would wake up early in the morning and work all day, without eating anything. He taught me how to take up space when you want to produce something on paper. He taught me how to open each vertebra so that your movement comes out exactly the way you want it to. He taught me how to try to work without leaving anything to chance. When he works, he is either on his knees or standing up. He also taught me how to make my own materials and ink. But it was all a collaboration, we learned from one another. That was what he wanted before his death. It was really beautiful. I started alone but now I have a team. It’s like a movie director, you have the ideas but you need a team to assist you. I’m currently training two young girls who are making very promising work. I really believe in them. I have a few assistants that help my work to be more fluid. They take care of administrative tasks: they pick things up for me, etc., so that I can focus on my writing. My graphic designer lives in Haute-Savoie and she takes care of scanning for me and imagines a whole world around all of my projects. We are in constant dialogue with each other. She has an eye for things. It’s a real work of deconstruction. She sees all the little details and faults. You need to capture everything in the scans, the texture, the layers—all of the subtleties…or else there’s no balance. Sometimes I call upon architects, home designers, because I need to consult with them on colors, trends, etc. All these people help me, provide me with feedback, and see what I don’t see. Even though you have a team now, do you still consider your work to be solitary? First of all, when I come up with an idea, there are only a few people who can understand the functionality behind it. The conversations I have with my team are very important. The people around me give me their opinion of my work, I ask them what they think. But yes, solitude is an integral part of calligraphy. I have to be in my own world. I can stay in my studio for months. There are things that I have a hard time getting out. I lose all sense of time. Even though I’m surrounded by people who love me, I will always have this inner solitude. I can be totally disconnected. You need to know yourself in order to take a pen and put your feelings down on paper. These are all people that I met by chance, on trips, like when I met Elodie in Corsica. She has a singer with tattoos all over her body and I immediately liked her. David Giroire, my press agent, is my best friend. I’ve known him for 15 years. Alexis Le Tan, my agent–I didn’t even know he was an agent because we met at a party—he’s a musician. We became friends and one day he asked to represent me. It was so spontaneous and natural, so I said yes. I’m all about family. I really like having my team, my cocoon. Kind of like you, actually. I like when I can have discussions, when I have direct contact with others. I really accept criticism because it’s super important in the construction of my work, even though most of the time I don’t change a lot of things. I listen a lot to what people have to say. What is the most exciting part is seeing people’s reactions after they receive the final product, seeing the experience that they are going to have with it. What do you think of the evolution of technology and the internet. How did it impact your work? I like it because it’s immediate. It’s nice for me to be able to show my ideas to people right away so they can get an idea right from the start. Because you immediately have an opinion of someone when you see them write. It worked pretty well for me. Now I’m a calligrapher! Do you think calligraphy will disappear because of technology? It’s true that I had this moment when I told myself that yes, calligraphy is beautiful, but you don’t need anything to do it. Because to make a logo, an image, you need a lot of materials. I was in India 3 years ago when L’Officiel Hommes commissioned me to do some illustrations for their special edition on aristocratic families and I was able to make some ink with water and soil. I cut a reed in half and wrote with it. I had this old notebook, so I erased everything I had written previously and I basically started doing calligraphy with dirty soil. I said to myself, “You can’t send a photo, you don’t have wifi.” Instead, I sent the notebook through the post office. Simple as that. I’m saying all this not because I want to show off or show myself but because I want to show that calligraphy is necessary. We will always have to write. For example, when a child has to correct his mistakes after writing it down on a paper, he has to do it by hand. He has to think before writing. He has to get to know himself in order to avoid making the same mistake again. I hate that we don’t teach kids how to write on paper anymore. They learn on a computer right away. Yes, but I’m sure that’s going to change. It’s all going to come back one day. We can’t do without the world of pens because writing things by hand brings out our imperfections. If you grow up without seeing your mistakes, you won’t know how to handle failure. All these mood boards, Tumblr pages etc. today don’t really belong to anyone in the end, there is no longer a sense of property. Whereas writing shows who you truly are. You need to know yourself in order to take a pen and put your feelings down on paper. There are difficult phases in every lifetime and I think it’s important to take the time to sit down and be alone sometimes. I write 8 hours every day. With calligraphy, you are eternally unsatisfied. Would you consider calligraphy to be a kind of sport, a physical activity? Yes, but when I am sore it means that I forgot about my posture, I forgot myself. Good posture is mandatory. Also, I shouldn’t overdo it. During Fashion Weeks, I’m used to it now and I’m an insomniac, so it works out, but 3 hours of sleep per day for 2 weeks really isn’t good. I can see that my work towards the end is less beautiful. I write 8 hours every day. With calligraphy, you are eternally unsatisfied. The idea is to not write anything and everything. You get an idea, you start over, you change it. You create a path for yourself that comes from within. Like sport, it can demanding and requires endurance. Do you take care of your hands? Yes, I get a lot of massages, I love it. It reminds me of vacation. When you’re on vacation, what happens if you don’t write everyday? Oh, I have to. Even on vacation, I still work on my calligraphy. I’m always writing, I have notebooks everywhere. There are words that I like for their meaning, and they’ll move me to find a line that represents the rhythm of the word and its meaning. Or sometimes it’s the opposite. If I I’m trying to think of something, in order for it to be clear,I need to write it down. I need a pen. Exactly, it’s my second language. Are you sometimes scared of being in an accident? I know that I stopped snowboarding, for example. Yes, absolutely. I love to snowboard too, but I can’t do it anymore. I have contracts for important projects; people are counting on me. My hands are fully insured, in fact. Snowboarding, skiing, even though my parents live right next to a ski slope. So now we go to the beach, where it’s sunny. Last time I was in New York, I don’t know what got into me but I wanted to rollerblade. I rollerbladed until I was exhausted, but I was super cautious, and didn’t push myself too hard. I’m careful. I knock on wood. When I get pins and needles in my hands, and my hand feels numb, I get really scared. My worst nightmare is when I sleep on my arm and it falls asleep. It’s horrible. What kinds of instruments would you advise young calligraphers to start with? A pen you feel really comfortable with. It could be a Bic, a fountain pen, the tip of a compass. That’s what calligraphy is all about. Other than that, I recommend starting with a paintbrush; it’s so delicate that it teaches you balance. After that, you can go straight to working with a fountain pen. There’s no specific technique. The only technique you need is to tell yourself that anything is possible. What do you dream of doing in the future? I have a few specific wishes. I love the Woolworth building in New York, for example, and the other day while looking at it I had this idea to create a metallic embroidery using calligraphy. I like the idea of working metal into the concept of heritage. I would like to work with Plexiglas or glass more and try to make them just as important as a diamond. Everything I do is a constant work in progress. Right now I’m working on a conceptual piece involving ceramics and I won’t give up until I’ve found a way to create exactly what I want. I’m very stubborn. What would be your best advice to pass along to aspiring calligraphers? There are people who have helped me throughout my life, and I am grateful to them every time I work. J’aime beaucoup tes interviews carrières, la calligraphie est un métier si rare. Nicolas a vraiment un parcours hors du commun! Tu le connaissais avant de créer ton blog? Garance, je viens lire, voyager, m’immerger dans votre univers très régulièrement. Merci de nous faire partager d’autres vies, toutes sortes d’envies. La calligraphe est, pour moi, à la fois styliste et chorégraphe : Il habille les mots et les fait danser, c’est beau ! Cela donne envie d’apprendre ! He is a great artist, nice interview!! He has such a wonderful career this is so inspiring. C’est beau! Merci merci merci! Quelle belle personne! Franchement ça donne envie de le rencontrer. Une fois encore c’est une interview si passionnante ! Il n’a pas peur de changer de direction tout en respectant toujours son désir. Comme j’adore son “Putain j’aime çà” car c’est vrai, çà commence quand on a ce sentiment si fort de complétude. Je suis quasi sûre que l’existence t’envoie alors les bonnes personnes, tu es sur leur route ou elles sont sur la tienne. J’ai adoré suivre les cours de calligraphie avec une vieille dame chinoise, faire ce qu’elle appelait le Qigong du pinceau avant de commencer les exercices, la posture et la respiration ! C’est une ouverture immense, son trajet multi-pistes le prouve. Belle rencontre entre vous deux ! His work is amazing and this interview is fantastic! I love the careers section, is always great to know how talented people achieve to fulfill their dreams and professional life! Très beau parcours que celui de Nicolas, un vrai voyage !! J’ai la chance d’avoir deux objets qu’il a calligraphié à mon nom et je les garde précieusement. merci pour cette super interview! Chere Garance, en lisant cette interview j’ai eu l’impression de vous entendre. Peut-etre parce que vous etes des artistes tous les deux. J’ai beaucoup aime son parcours et la facon dont il approche son Art, avec amour et respect. Cette lecture a renforce mon envie d’ecrire a la plume. Merci pour cette interview. What a great read, very interesting! Quelle interview captivante ! Merci pour cette belle rencontre avec un homme passionnant au métier fascinant. Merci Garance! Passionant à lire! Ah ça fait longtemps que je l’attendais cette interview, merci!! This was one of your best posts and a great interview… maybe one of the best interviews I’ve ever read. I really felt like I got to know Nicolas and the conversation lifted my spirits for the day. Thank you. Yes yes, I second that. At some points his words deeply moved me. Since you started to show us teasers of his work I am inspired of him and I undusted my tools. He is so right, handwriting is something you can loose. Mine has gone from once pretty decent to children-starter. About the survival of calligraphy, I think, it will become only something for artists. In a few years I am sure that only specialists will write with their own hands but also in this development there will be more of them than now. A true artist. Thank you for long and inspiriting interview. I spend too much time typing and have almost forgotten how to use a pen. The art of hand letter writing has been forgotten. A resurgence is in order. I keep all my Fashion Week invitations…works of art in themselves. What an interesting guy and story! That was a really lovely & thoughtful interview. Thank you Garance & Nicolas!!! Je ne sais pas trop quoi dire, j’ai eu la chair de poule à plusieurs moments (et ça n’a rien à voir avec sa photo…) c’est juste la meilleure, la plus belle interview carrière que tu aies faite, d’une richesse inouïe, avec une personne qui a énormément de beauté et de profondeur en elle. J’ai l’impression que c’est “un mec bien” en plus. Pffffiou, quelle claque. J’espère qu’il continue à aller dans les écoles, que nos petits voient ce que c’est que la passion et la beauté. Je ne laisse jamais de commentaires mais là je ne peux pas faire autrement. J’adore ce genre de parcours… je trouve ça magnifique de voir comment avec beaucoup de passion on peut arriver à se créer un métier aussi poétique. Et comment un réseau peut se construire de façon si naturelle à travers le monde. Merci pour cette belle interview. This interview was incredibly inspiring. I have to say, it just made my day. He’s such a beautiful and talented human beign! This encompasses everything I love! He is the coolest interview. this reminds me of my favorite book titled “the Calligrapher” . I also find it hearbreaking to not see the handwriting of people anymore. Recently I read that if someone is your real (not online) friend, you will recognize their writing. Thank you Garance for this interview, it really inspired me! I find him very honest in the way he let us into his world of proffesion with details, it shows me he is open hearted.I believe he has a lot more stories to be told. I always loved calligraphy and the heritage of writting…and I agree with him, the art of writting/illustrating by hand will only be more treasured as the digital time of immediate results is trying to overpower it. (I believe it can still go hand in hand though). The key is in the process of making, as he said, it is that time you thing about what and how you wright it. He really is a great combination of humbleness but still stubbornness and openness…he is open to the world. I guess with a little pinch of “luck” the magic happens…and you find your own passion. Cette interview est super chouette, le parcours de cet homme est tout à fait fascinant…! Ca pourrait être une chouette idée pour le blog d’aller à la rencontre d’artistes de ce genre, ou de toute personnalité originale et humble et à la fois. I didn0t know him, what incredible and interesting thing read this post! Il est passionnant et inspirant ! waaaou un mec vraiment interessant! Trop intéressant ce métier auquel on ne pense jamais!! Merci pour ce voyage à travers les mots et l’art, cette interview est somptueuse, tellement inspirante, merci ! I found his life story to be so interesting, his experiences kept on flowing, truly extraordinary. Cette interview est vraiment superbe! J’adore ce genre d’article!!! En tout cas, c’est hyper intéressant de mieux connaître son parcours!!! Thank you Garance for this interview! Very interesting and touching! I read it – however very long it is ;) with a great interest! C’est vraiment une super idée ces articles carrière ! This interview was amazing–his answers are incredibly inspiring. Merci Garance…l’une des meilleures interviews, si ce n’est la meilleure! Incroyable. Very inspiring. I wanted to be a butcher when I was little, too. Now I’m a vegetarian working in the arts. Ha! I actually took a short course about calligraphy, I actually still have my calligraphy pens and ink, note book, several Sharpies… But I’m sad that I don’t get to practice. I’m amazed that Nicolas does it everyday, for 8 hours! Wow! Très belle interview, j’aurais bien aimé voir ses réalisations ! très belle interview .. tout cela me conforte largement dans la nécessité de l’écriture, de la main au bout de l’âme qui manie l’encre et qui aboutit à sa propre écriture / versus les écrans dans l’éducation de mes / nos enfants …..
Merci pour la découverte de ce métier ! Je suis très attachée au rapport à l’écriture, ça me parle beaucoup. Et le parcours de cet homme de talent est très enrichissant. Wow, je suis étonnée par la sagesse très profonde de la personne interviewée. J’ai adoré ça! Merci Garance! Un très bon interview! Wow, so honest and so passionate about his work! Unlike most people who claim to be passionate about their work he really showed his passion through his stories! Very inspiring! Your best interview so far! Very inspiring to read. I like to read about people who carve out alternative careers. It makes me want to quit my desk job! Thank you for the interview. 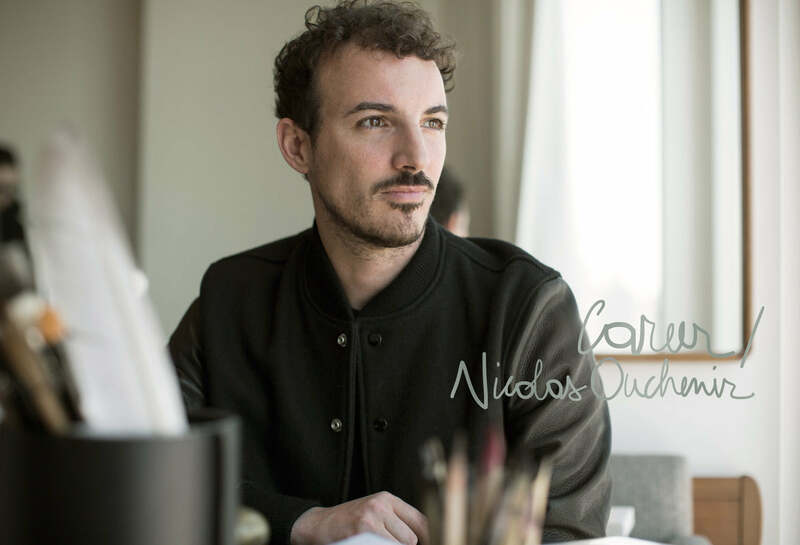 Thank you so much for this beautiful interview with Nicolas, Garance. This is the loveliest article I have ever read. It’s wonderful to see such interest in the posts responding to your article about what is essentially a dying – and essential – art form. We don’t realise how little we write these days with mobile phones and computers in abundance. It was so amazing to read how Nicolas learnt from the Chinese master to breathe and infuse calligraphy with his life breath – so that each stroke contains the very essence and physicality of the calligrapher. After abandoning calligraphy a year and a half ago, this has inspired me to return to this most exquisite exercise of physical writing. Travaillant moi-même dans une grande galerie parisienne, ça me donne envie de mettre en place d’aussi jolis cartons pour nos vernissages. C’est tellement plus personnel et ça fait de l’invitation un objet unique qu’on a envie de garder. Bref, je me retrouve à fond dans ce parcours ! Ce gars est fascinant par ce qu’il fait et par ce qu’il est, talentueux, sincère, modeste. La modestie me frappe quant elle vient de personnes comme lui qui ont un véritable don, et qui semblent encore s’en émerveiller. Son travail est un éloge à la lenteur, qui trouve aujourd’hui étonnamment sa place dans le monde de l’hyper-technicité. A la lenteur et à la recherche de la perfection dans l’unique, c’est peut être la clé. Merci pour ce bel interview. Ses propos me touchent particulièrement. Je suis au travail et je me retiens de ne pas pleurer. Merci Garance de nous faire partager cette rencontre. P.S. Chinese sees Chinese painting and calligraphy a form of Qi Gong and that is why a lot of the traditional painters live long. It is totally a form of lifestyle. What a beautiful interview, thanks!! Loved the article about Nicolas! I had always heard there was a great calligrapher in Paris and I guess that is Nicolas. mood board or page with a few examples… By the way your writing is really wonderful too!!!! Interview assez émouvante à certains passages ! Étonnant ce garçon. greatest websites online. I’m going to recommend this site!